The birth of the Royal baby is expected to spark a surge of interest in Connected Histories, as users explore how royal births and their reception have changed throughout history. Developed collaboratively with the University of Sheffield’s Humanities Research Institute (HRI), Connected Histories brings together 22 digital resources related to early, modern and 19th century Britain. The search engine allows researchers to collect and share important sources for British history in one place, showing up unexpected connections and surprising parallels, whether from 19thcentury newspapers, the records of courts and parliaments, or drawings. It also allows sophisticated searching of names, places and dates. The project, funded by Jisc, an organisation which champions the use of digital technologies in education and research, is a partnership between the University of Sheffield, the University of Hertfordshire, the Institute of Historical Research and the University of London. The University of Sheffield’s HRI developed and maintains the search engine which drives the Connected Histories website, comprising around 30 billion items of data which have been analysed using language algorithms to facilitate searching by keyword, person name, place and date. A search for terms related to ‘royal births’ highlights a wealth of information drawn from historical sources across British history, revealing changes in medical practices, celebrations and cultural behaviours. 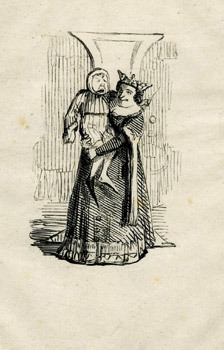 A baby picture of our longest-reigning monarch, Victoria, drawn in 1820, when her 64-year reign was still ahead of her. See the full article on the University news feed. This entry was posted in News and tagged Bob Shoemaker, Connected Histories, history, HRI, royal baby, Royal Birth on November 6, 2013 by James Pearson.